A hookah, originally referred to as a nargileh or a shisha, is a kind of waterpipe used for smoking wet tobacco called Moassel (or in the United States, Sisha—yeah, we got our words all mixed up over here). 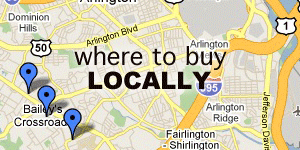 Getting an excellent smoke session from a hookah isn’t something most people can do without a little guidance. There are many caveats to a great session that take some time and practice to master. In this series of tutorials, we hope to help new smokers (and those who’ve been sojourning from the culture for some time) get their sessions great under the most common circumstances. So, please, grab a good cup of coffee or your favorite tea, set your hookah at your side, and let’s get started! The bowl is usually made of clay or ceramic. While there are many advanced bowls you can choose from to achieve a more dramatic experience, a standard bowl is what most people start out with. A standard bowl is typically three to four inches tall and has a reservoir which holds the tobacco. At the bottom of the reservoir there are around three to five holes for the air to pass through after heating the tobacco. The coal tray sits between the bowl and the top of the stem. It is used to hold coals while making adjustments to the bowl, as well as catch ash that is brushed off the top of your bowl as the coals burn down. A good sized tray will help keep your smoking space clean. The tray may simply rest on a ledge at the top of the stem, or on some hookahs, may be secured by a top-stem piece which screws on. Usually made of stainless steel or brass, the stem is typically the tallest part of the hookah. The stem has the dual function of carrying smoke from the bowl to the base, as well as cooling the smoke on the way. The more metal there is in the stem, and the longer the stem is, the more opportunity it will have to absorb heat from the smoke, therefore producing a smoother smoking experience. Attached directly to the stem you will find your purge valve and your hose port. The purge valve is an exit-only valve used to clear any smoke that may be stored in the base of the hookah. The purge valve is used when the smoker blows air into the hose. This is typically done if the smoke becomes harsh. Inside the purge valve is a ball bearing which lifts up when purging, and is pulled down to create a seal when drawing. The hose port, as the name suggest, is the hole into which you will secure your hose. A rubber or plastic grommet will be used to keep air from being pulled into your hose from outside your hookah. Some hookahs may have more than one hose port. When this is the case, the hose port will often also house a ball bearing which lifts up when smoke is being pulled through the hookah, and be pulled down to create a seal when smoke is being pulled through one of the other ports. This is common among Chinese made hookahs, but irregular for taller, Egyptian and Syrian hookahs. If you’re hookah has more than one hose port, but does not have ball bearing seals in them, the other ports must be sealed when drawing smoke, otherwise air will be pulled through the open ports, thinning the smoke and ruining your smoke session. 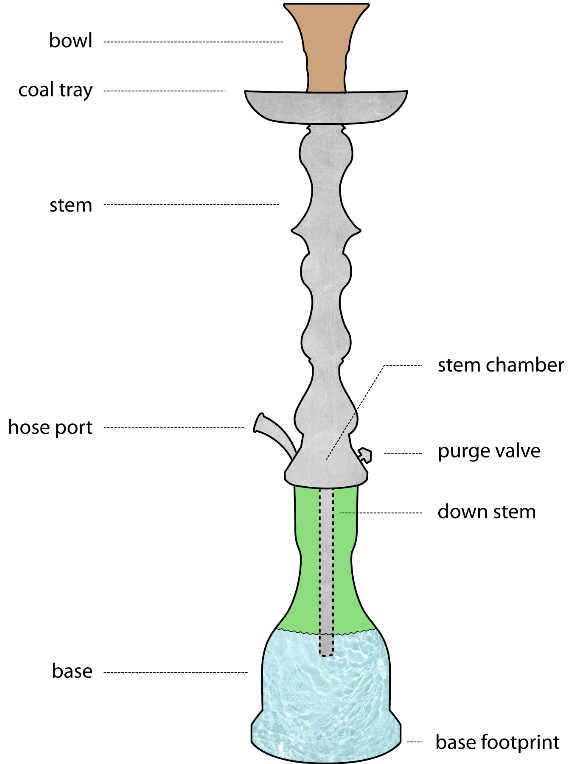 The down stem is the portion of the stem which extends into the base and submerges in water. 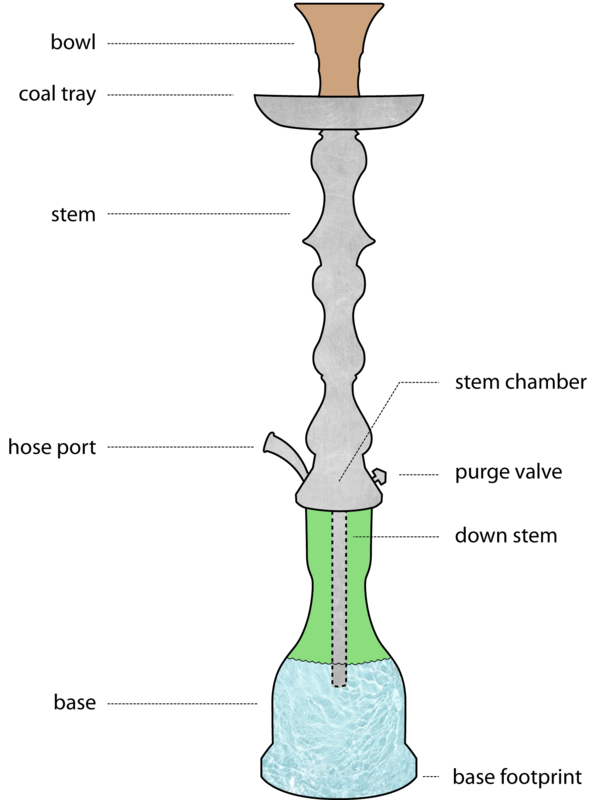 At the top of the down stem is the “stem chamber”. Chinese made hookahs typically have what is called a “common chamber”. This means there is no division inside the stem between the purge valve and the hose port. Common chambers make purging smoke next to impossible. Most Egyptian and Syrian hookahs have a “divided chamber”, which means there is an inner wall between the purge valve and the hose port. When this is the case, purging your hookah forces air into the hookah base, and releases the air and the smoke out from the purge valve. The hose is the tube that connects to your stem and carries smoke from you hookah to your mouth. 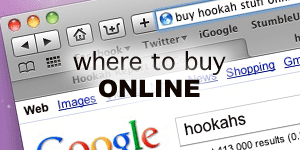 Most hoses that come with your hookah will be constructed from a metal coil wrapped in faux-leather. This helps the hose to maintain its circular shape, regardless of how it’s bent, as well as maintain a useful flexibility. These hoses are prone to rust and should be replaced after every three to six months of regular smoking. Water should never be run through these hoses. Some aftermarket hoses, such as the Nammor, the Razan and the Narbish are constructed entirely of plastic and can be washed with water and will therefore last indefinitely (provided you don’t rest them on a hot coal as I have done on more than one occasion). These hoses, however, tend to be more ridged than non-washable ones. The hookah base is usually made of glass that will not absorb flavor. It will be filled with water to help filter and cool the smoke. Cheaper glass will break more easily, but most quality pipes will come with good, thick glass. The size of the base itself is not especially important, although the larger the base’s footprint, the less likely it is that the hookah will tip over. It should also be noted, that a smaller base may bring the water too close to the stem chamber. When this happens, the bubbling water may be pulled into the hose. If you have a standard, non-washable hose, this will inevitably cause your hose to rust more quickly and need replacing. We’ll be working our way down the hookah. Next time we’ll be discussing charcoal, an essential element to smoking and enjoying hookah. So stay tuned and subscribe!